How did Borat get in there? 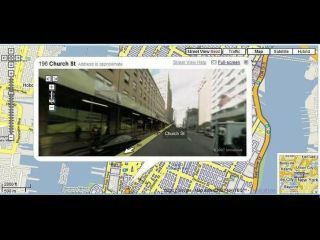 Google Street View: extraordinary collection of panoramic street-level images captured by Google’s magic van? Or window into a strange and timeless parallel universe? Since the launch of the service last year, numerous bizarre goings-on have been sighted in the background of even the most mundane of images. To that end, the Times this week created a Top 10 list of the strangest spectacles spotted so far. Watch out for ‘Borat peeking out of a window in San Jose, California’, and (our fave) ‘Strange, headless figures next to what looks like a newly dug grave’. They’ve only done 25 US cities so far – roll on the rest of the world, that’s what we say.